A huge issue that is prevalent in the United States could very well be affecting you as you read this article. I see patients with this disease day in and day out. Some patients may be well controlled; others may be drinking water and urinating constantly. Today we will be discussing type 2 diabetes, but not so much the signs and symptoms or the diagnosis, but rather on treatment options, specifically those that help reduce these patient’s risk of cardiovascular complications (heart attack and stroke). Diabetes is a known cardiovascular risk equivalent and is overwhelmingly one of the most, if not the most, important factor in the risk reduction of heart disease. The most important goal of treating type 2 diabetes is controlling the A1c level and reducing complications. One of the most common complications associated with this disease is coronary artery and cerebrovascular disease. This is why numerous new medications, as well as novel studies, have been released to see which of the myriad of type 2 diabetes medications might help to reduce the risk of heart disease, or aid in the prevention of a patient having a repeat cardiac event. The first line go-to medication for the overwhelming amount of people with type 2 diabetes is Metformin. However, since this medication has been on the market for such an extended period of time, its cardiovascular effects have not been adequately studied. Liraglutide (Victoza) has been approved to reduce the risk of major cardiovascular events in patients with type 2 diabetes. Albiglutide (Tanzeum), Dulaglutide (Trulicity), and Exenatide (Byetta, Bydureon) have yet to release studies on cardiovascular benefit but are believed to be in the works. A hold up with some of these medications are cost as well as the fact that they are injectable, which some patients may not enjoy.However, some of them are once weekly instead of daily injections which can lessen injection burden. However, there is light at the end of the tunnel, as the first oral GLP1 agonist is currently in clinical trials. DPP-4 inhibitors are another class of medications for the treatment of type 2 diabetes.In the SAVOR-TIMI 53 study saxagliptin (Onglyza) was studied and found to neither increase or decrease the risk of ischemic cardiac events.1 However, the study found that patients taking saxagliptin were more often hospitalized for acute exacerbations of congestive heart failure. The double-blind EXAMINE trial assessed alogliptin (Nesina) which found no increase in the risk of cardiovascular death, nonfatal stroke, or nonfatal myocardial infarction, but no benefit either. Also, contrasting from saxagliptin there was no increase in the risk of heart failure hospitalization with alogliptin. Lastly, a pooled study in patients on linagliptin (Tradjenta) found that there was no increase, nor benefit in the incidence of cardiovascular death, nonfatal myocardial infarction, or stroke. Overall, DPP-4 inhibitors do not seem to improve the risk of cardiovascular events in patients with type 2 diabetes, but they do not increase this risk either. Dapagliflozin (Farxiga) and Ertugliflozin (Steglatro) are other SGLT2 inhibitors, but there is no current data to believe that there is a reduced rate of cardiovascular events with this medication. Thiazolidinediones include rosiglitazone and pioglitazone. Throughout the time of their existence, they have gotten a bad reputation due to their risk and past black box warning for increased risk of heart failure. Meglitinides, Repaglinide and Nateglinide, have not shown any effect on cardiovascular outcomes in patients with type 2 diabetes. For those who are reading this article that are not in the medical field, especially for those that have type 2 diabetics, the risk of cardiovascular disease, including heart attack and stroke is real. I am confident Gray could tell you numerous instances of these cases that he has seen in the ER, Zach in the inpatient side, as could Andrew, Dan, or I in our personal patients. The key to treatment of the disease is not only controlling the blood glucose levels to help get the A1c at goal, but it is also equally important to view each patient individually and look at their risk of heart attack and stroke and try to prevent this as best as we can. These studies above allow us to apply that data to try to protect patients from these events. 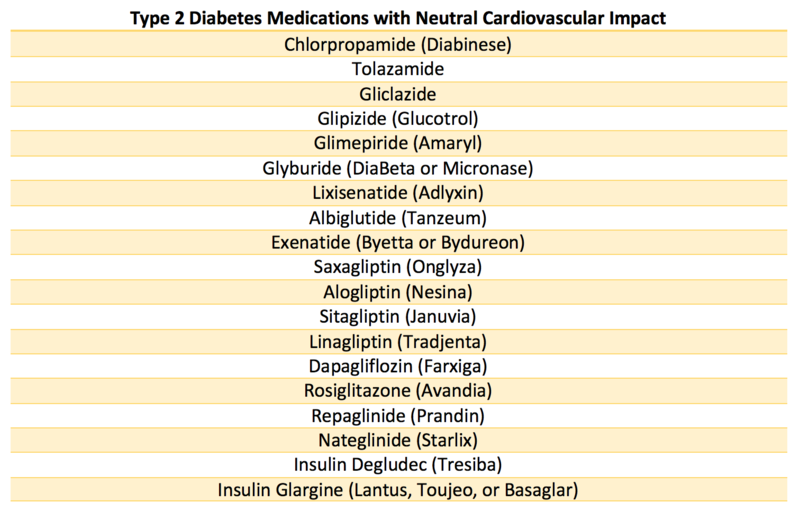 Treating a blood glucose level is great, but what good is it if your patient has a heart attack or stroke…Remember to treat type 2 diabetes as a cardiovascular risk equivalent, and to use these medications to the best of your ability. A final note, these medications might help treat the disease, but the only way to cure the disease is through the implementation of lifestyle changes with diet and exercise or other avenues leading to weight loss.Medication can help, but will not cure the disease.